Having dandelions in your yard can be annoying, but some cultures have used these common weeds -- whose scientific name is Taraxacum officinale -- to treat everything from liver ailments to heartburn to lactation problems. You can find wine made from the yellow flowers, vitamin- and mineral-packed dandelion greens in the produce section of your supermarket and herbal teas made from the root of the plant. Talk to your doctor about whether dandelion root tea is safe for you, because drinking it can interfere with medications and could lead to unwanted side effects. Dandelion root acts as a laxative and may aid digestion, says the University of Maryland Medical Center. Some animal studies suggest the plant may help improve cholesterol and triglyceride levels and act as an anti-inflammatory, but research on humans is lacking for these and other purported uses. Herbalists and alternative health care providers recommend dandelion root to detoxify the liver and gall bladder, but the evidence for this effect rests on one weak study, says UMMC. In fact, your organs perform detoxification for you on a routine basis. As noted by the British Dietetic Association, if your organs were not functioning properly and your body filled with toxins, you would be seriously ill and in need of more than tea. The dandelion plant is generally considered safe for consumption, but, like other herbs, it can have adverse effects in some people. Dandelion root tea may negatively affect your digestive system, causing diarrhea, stomach inflammation or heartburn. 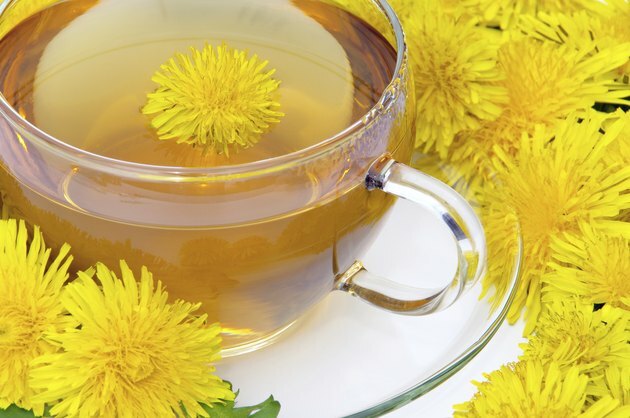 In one report, a woman who used a product with dandelion as an ingredient experienced cystitis, or inflammation of the bladder. Some people may experience an allergic reaction to dandelion and related plants. If you are allergic to chamomile, chrysanthemums, marigold, yarrow and the ragweed plant family, dandelion tea may not be right for you. Allergy symptoms seem to occur more often, however, when sensitive people simply touch the weed directly. Contact can cause itching and rash, inflamed eyes, a runny nose or difficulty breathing. If you have any of these side effects after drinking dandelion tea, discontinue use and consult a doctor. Dandelion has the potential to affect your medications, although this may occur primarily with the leaf of the plant and not the root. For example, dandelion can make medications leave your body more quickly. People on blood-thinning medications may be at risk for bleeding if they take dandelion, and diabetics may find that the herb lowers their blood sugar. Dandelion may also worsen the side effects of the drug lithium, a treatment for bipolar disorder. Given dandelion’s numerous potential drug interactions, it's wise to talk to your doctor about drinking dandelion root tea. You can find dandelion root as dried loose tea or in teabags at the supermarket. It can have a slightly bitter flavor, and may benefit from a sweetener like honey. If you’re ambitious, you can also pick your own roots, then chop and roast them to make a dandelion root “coffee” with a flavor that’s close to coffee without the caffeine.